Our Specialist Orthodontist Dr Vasileios Charalampakis provides a comprehensive specialist orthodontic service including Invisalign, Incognito lingual braces, traditional fixed braces using metal and tooth coloured brackets. We were one of the first 30 U.K. dentists to be formally trained and certified in using the revolutionary, new Inman orthodontic aligner and so we have already successfully completed a large number of satisfied cases, having been inundated with interest in the aligner. 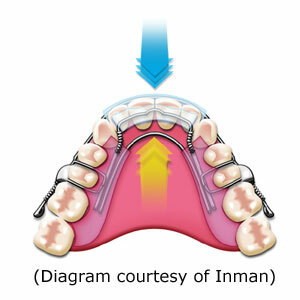 The Inman aligner is a unique, discrete and removable appliance which is proven for straightening upper and lower front teeth which may be crowded, crooked, rotated or tilted, on average taking an impressively rapid 2 to 3months to complete. 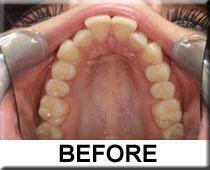 Patients then wear a retainer to keep the desired finished position. The Inman aligner can be an ideal alternative to unsightly fixed “train-track” braces and will often produce fantastic cosmetic results more quickly, while patients pay a lower fee, compared to traditional fixed “train-track” braces. Please book in to see us and find out if you are suitable to benefit from this exciting innovation. Call us NOW on 01453 764287. 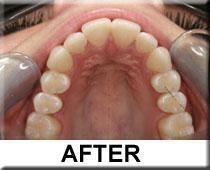 The pictures above are from one of our own Inman Aligner cases completed at Confident Dental Care & Implant Centre. 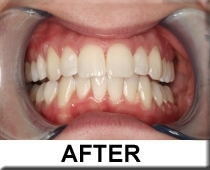 This case also benefited from tooth whitening upon completing the tooth straightening and many of our patients have found that whitening is a fantastic complement to their new straighter teeth. It’s clear to see the amazing results that can be achieved with this system and in some cases, taking as little time as 6 weeks!! 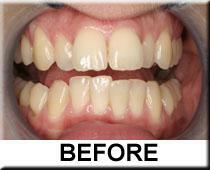 Have a more beautiful, straight and confident smile in as little as 6 weeks! New state-of-the-art braces now available in Stroud! The discrete Inman aligner being worn by a patient treated by Confident Dental Care & Implant Centre. Have you ever wondered if there was an affordable way to straighten your teeth in just a few weeks, without having to wear unsightly fixed braces? Happily, now there is, thanks to a revolutionary new treatment that is being offered by us at Confident Dental Care & Implant Centre in Stroud, Gloucestershire. Cost effective – we were one of the first dentists in the UK to offer treatment with the new Inman Aligner, a virtually invisible appliance which depending on case complexity, can straighten misaligned (wonky/crowded) upper or lower front teeth in just 6-16 weeks and is much more cost-effective for the patient than other systems as alignment is more rapid, meaning less clinical time is required and usually only one appliance is required from start to finish which saves on lab costs. Discrete – The Inman Aligner is similar to a sports mouthguard, but is thinner and transparent, which means it is almost invisible to other people. “Patients find the appliance will affect their speech and produce slightly more saliva in the first few days while they get used to wearing it but this is the same for anything new introduced into the mouth and in my experience, all patients treated find they acclimatise to wearing the Inman Aligner very rapidly”. While the aligner can be removed easily if required, acclimatisation is more rapid if the patient perseveres with wear initially. “I have found the Inman Aligner is the ideal solution for patients who are self-conscious about their mis-aligned teeth, and prefer a rapid improvement in their smile”, “because the Inman Aligner is clear, it is discrete and almost invisible and so makes a great option for patients for whom their appearance is important”. Minimal – The Inman Aligner has proven invaluable for patients having other cosmetic work carried out. “Using the Inman Aligner before having veneers prepared can significantly reduce the preparation work to such an extent that patients can opt for modern minimal or even no-preparation veneers, whereas previously they wouldn’t have been able to”. This preserves as much precious natural tooth enamel as possible. Convenient and rapid – The aligner can be removed, which allows patients freedom to eat as they please and to maintain excellent oral hygiene by cleaning your teeth as normal, without the need for fiddly brushing between wires as would be the case with conventional fixed braces. You don’t need to wear the Inman Aligner constantly if you don’t want to, “because the Inman Aligner is removable, it does not need to be worn all the time. For instance, if you have an important meeting, you can simply leave the aligner at home, and eat and speak with confidence”. However, we recommend wearing it for at least 16-20 hours a day to ensure the quickest results. The discrete clear acrylic at the front of the teeth (see photo above), combined with springs concealed behind the teeth, gently squeeze your teeth into the correct position as can be seen in the diagram. Total treatment can take from 6-16 weeks, which means you could have a beautifully straight, more confident smile in four months at the very most – significantly less than any other orthodontic treatment. During treatment you will normally need to come and see us for a check every 1-2 weeks and at these appointments, we will create space for the teeth to move by carefully smoothing between the mis-aligned wonky teeth with abrasive strips. After the teeth are aligned, the patient must be committed to wearing a discrete retainer (fixed or removable) for as long as they want their teeth to remain straight! The Inman Aligner is not suitable for children aged under 14, because it can only be fitted to fully-formed teeth. It is also only effective on mild to moderately mis-aligned teeth but patients with more severely mis-aligned teeth may still benefit from the Inman Aligner as a pre-treatment to minimise the preparation required for restorative treatments like veneers. Call Now! To find out more about how the Inman Aligner can help give you a beautifully straight smile, or to book a consultation with us for Inman Aligner treatment, call Confident Dental Care & Implant Centre today on 01453 764 287.